HT406 1-in. 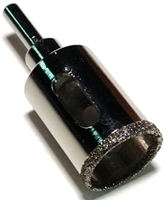 or 25mm Diamond core drill bit for glass, ceramic, or tile. This diamond core drill bit is used for a very precise and clean-cut surface grinding. The tool gives best quality output to smoothly slab through surface such as glass, ceramic or tile with silky smooth finish. We have years of experience working with drilling machine accessories and promise user satisfaction. With free shipping over bulk buying, we offer the best deals for core and drill bits. Our prices are extremely economical with a promise of highest quality material and best value for your money. 1-in. Diamond core drill bit for glass, ceramic, or tile.